Mouse anti Human beta-amyloid protein 42 antibody, clone Mab1.1 recognizes Beta-amyloid protein 42 (also known as Aβ42), the 42 amino acid peptide processed from Amyloid precursor protein (APP). There are several forms of Aβ peptides processed from APP, the most common being Aβ40 and Aβ42. Amyloid plaques contain both Aβ40 and Aβ42. Aβ40 is more common, but Aβ42 more fibrillogenic and therefore associated with disease states such as Alzheimer’s disease. Mouse anti Human beta-amyloid protein 42 antibody, clone Mab1.1 specifically binds to the 37-42aa region, and does not recognise full-length APP or the 40 amino acid peptide processed from APP (Aβ40). 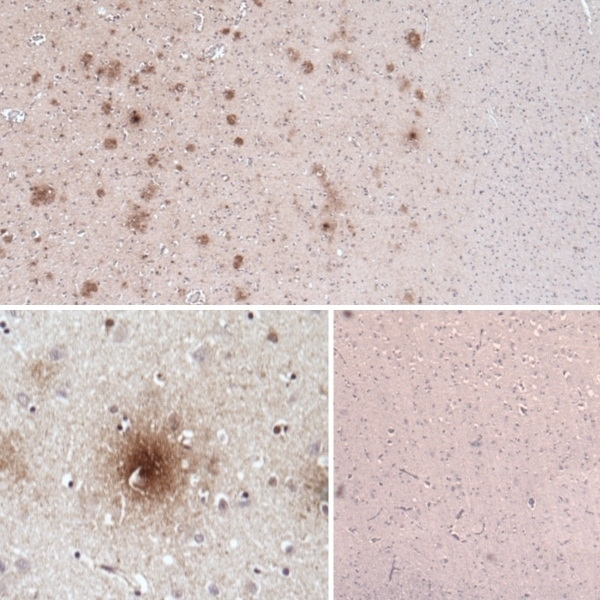 It stains diffuse plaques found in the brain of Alzheimer’s disease patients. It does not stain healthy brain tissue or other organs. A construct of the last six amino acids of Aβ42 (GGVVIA) and a potent T-cell epitope from Chlamydia pneumonia CWL pmp8-protein, synthesised directly onto an LPA scaffold (See Axelsen et al. for full details). If plates are coated with 2ug/ml Aβ42, clone Mab1.1 can be used at a dilution of 0.2ug/ml for an OD of approximately 2. Axelsen, T.V. et al. (2009) Specific recognition of the C-terminal end of A beta 42 by a high affinity monoclonal antibody. Mol Immunol. 46 (11-12): 2267-73.